I don’t know if most people realize how much credit card debt fell during and after the Great Recession. It fell by a lot! Credit card debt outstanding today is about $180 billion, or 21 percent, lower than it was at the end of 2007. This is a 50 percent larger fall than in mortgage debt in percentage terms — though the fall in mortgages is of course much bigger in absolute dollars. This fall in credit card debt is entirely explained by the drop in the number of credit card accounts, from about 500 million to 380 million. The average balance on open credit card accounts is about the same today as it was when the recession began. The obvious question is, is this fall in consumer credit due to supply, or demand? Are banks less willing to lend, or are households less eager to borrow? Here’s some interesting data that helps shed light on this question, from the Fed’s most recent Quarterly Report on Household Credit and Finance. The red line shows the number of credit card accounts closed over the preceding 12 months, while the blue line shows the number opened. So the gap between the blue and red lines equals the change in the number of accounts. The spike in the red line is mostly write-offs, or defaults. I’ll return to those in a subsequent post; for now let’s look at the blue and green lines. The green line shows the number of inquiries, that is, applications for new cards by consumers. The blue line, again, shows the number issued. As we can see, the number of new accounts tracks the number of inquiries almost exactly. What do we conclude from this? That the fall in the rate at which new credit cards are issued is entirely a matter of reduced demand, not supply. And given that balances on outstanding credit cards have not fallen, it’s hard to avoid the conclusion that banks’ reduced willingness to lend played little or no role in the fall in consumer credit. the ratio of applications to [home] sales has not risen notably in this slump, indicating that the inability of potential homebuyers to get mortgages has not been a big factor in the housing downturn. As a matter of fact, after reading that post (or one of Dean’s many others making the same point), I tried to construct a similar ratio for credit cards, but I wasn’t able to find the data. I didn’t realize then that the Fed publishes it regularly in the household credit report. Needless to say, the ratio of applications to contracts is hardly the last word on this question, and needless to say there are plenty of more sophisticated attempts out there to disentangle the roles of supply and demand in the fall in borrowing. Rather than get into the data issues in more detail right now, I want to talk about what is at stake. Does it matter whether a fall in borrowing is more driven by the supply of credit or the demand for it? I think it does, both for theory and for policy. One important question, of course, is the historical one: Did the financial crisis straightforwardly cause the recession by cutting off the supply of credit for nonfinancial borrowers, or were other factors more important? I admit to being agnostic on this question — I do think that credit constraints were dragging down fixed investment in the year or so before the recession officially began, but I’m not sure how important this was quantitatively. But setting aside the historical question, we also need to ask, is the availability of credit the binding constraint on real activity today? There is indeed a “fundamental” configuration of asset prices–one that produces full employment, the optimal level of investment given the time preference of economic agents and the expected future growth of the economy, and the optimal division of investment between safe, moderately risky, and blue-sky projects. However, right now the private market cannot deliver this “fundamental” configuration of asset prices. The aftermath of the financial crisis has left us without sufficient trusted financial intermediaries … no private-sector agent can create the safe securities that patient and prudent investors wish to hold. The overleverage left in the aftermath of the financial crisis has left a good many investors and financial intermediaries petrified of losing all their money and being forced to exit the game–hence the risk tolerance of the private sector is depressed far below levels that are appropriate given the fundamentals… Until this overleverage is worked off, the private marketplace left to its own will deliver a price of safe assets far above fundamentals … and a level of investment and thus of employment far below the economy’s sustainable and optimal equilibrium. In such a situation, by issuing safe assets–and thus raising their supply–the government pushes the price of safe assets down and thus closer to its proper fundamental equilibrium value. In other words, there is a unique, stable, optimal equilibrium for the macroeconomy. All agents know their expected lifetime income and preferred expenditures in that equilibrium. The only reason we are not there, is if some market fails to clear. If there is a shortfall of demand for currently produced output, then there must be excess demand for some asset the private sector cannot produce. In the monetarist version of the story, that asset is money. In DeLong’s version, it’s “safe assets” more generally. But the logic is the same. This is why DeLong is so confident that continued zero interest rates and QE must work — that it is literally impossible for output to remain below potential if the Fed follows its stated policy for the next three years. If the only reason for the economy to be off its unique, optimal growth path is excess demand for safe assets, then a sufficient increase in the supply of safe assets has to be able to get us back onto it. We’re looking at output relative to potential for GDP and its components; I’ve defined potential as 2.5 percent real annual growth from the 2007Q4 peak. 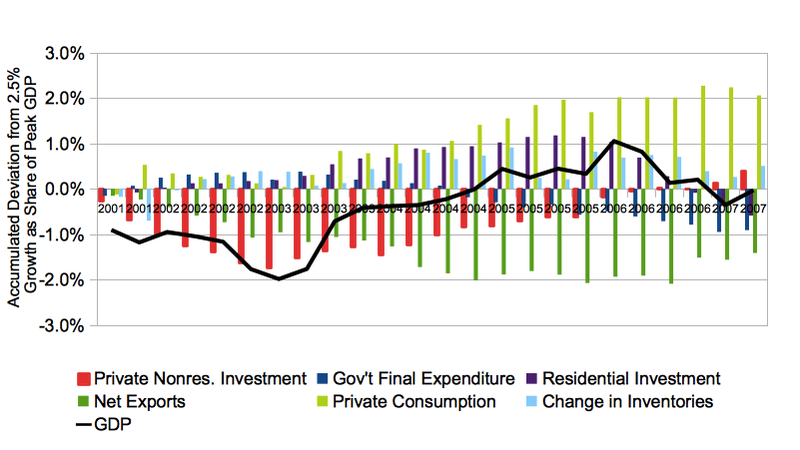 What we see here is investment and consumption both fell during the recession proper, but since 2010, investment has recovered strongly and is almost back to trend. The continued output gap is mainly accounted for by the failure of consumption to show any signs of returning to trend — if anything, consumption growth has decelerated further in the recovery. You can’t explain low household consumption demand in terms of a shortage of safe assets. The safest, most liquid asset available to households is bank deposits, and the supply of these is perfectly elastic. I should note that it is possible (though not necessarily correct) to explain falling consumption this way for the early 1930s, when people were trying to withdraw their savings from banks and convert them into cash. The private sector cannot print bills or mint coins. But classical bank runs are no longer a thing; people are not trying to literally hoard cash; it is impossible that a lack of safe savings vehicles for households is what’s holding down consumption today. So if we are going to explain the continued consumption shortfall in DeLong’s preferred terms, households must be credit-constrained. It is not plausible that households are restricting consumption in order to bid up the price of some money-like asset in fixed supply. But it is plausible that the lack of trusted financial intermediaries makes investors less willing to hold households’ debt, and that this is limiting some households’ ability to borrow and thus their consumption. In that case, it could be that increasing the supply of safe assets will provide enough of a cushion that investors are again willing to hold risky assets like household debt, and this will allow households to return to their optimal consumption path. That’s the only way DeLong’s story works. It’s plausible, yes; but is it true? The credit card data is evidence that, no, it is not. If you believe the evidence of that first figure, the fall in consumer borrowing is driven by demand, not supply; continued weakness in consumption is not the result of unwillingness of investors to hold household debt due to excess demand for safe assets. If you believe the figure, investors are no less willing to hold consumer debt than they were before the recession; it’s households that are less willing to borrow. Again, one figure isn’t dispositive. But what I really want to establish is the logical point: The shortage-of-safe-assets explanation of the continued output gap, and the corollary belief in the efficacy of monetary policy, only makes sense if the weakness in nonfinancial units’ expenditure is due to continued tightness of credit constraints. So every additional piece of evidence that low consumption (and investment, though again investment is not especially low) is not due to credit constraints, is another nail in the coffin of the shortage-of-safe-assets story. So what’s the alternative? Well, that’s beyond the scope of this post. But basically, it’s this. Rather than assume there is a unique, stable, optimal equilibrium, we say that the macroeconomy has multiple equilibria and/or divergent adjustment dynamics. More specifically, we emphasize the positive feedback between current income and expenditure. For small deviations in income, people and businesses don’t adjust their expenditure, but use credit and and/or liquid assets to maintain it at its normal level. But for large deviations, this buffering no longer takes place, both because of financing constraints and because true lifetime income is uncertain, so people’s beliefs about it change in response to changes in current income. I’m going to break that thought off here. The important point for now is that if you think that the continued depressed level of real economic activity is due to excess demand for safe assets, you really need evidence that the expenditure of households and businesses is limited by the unwillingness of investors to hold their liabilities, i.e. that they face credit constraints. And this credit card data is one more piece of evidence that they don’t. Which, among other things, makes it less likely that central bank interventions to remove risk from the balance sheets of the financial system will meaningfully boost output and employment. For some reason, inquiries are given over the past six months while the other two series are given over the past year. This implies that about half of all inquiries result in a new account being opened. The important point for our purposes is that this fraction did not change at all during the financial crisis and recession. To be fair, you can also find this story in the General Theory — “unemployment develops because people want the moon,” etc. But it’s not the only story you can find there. And, I would argue, Keynes really intends this as a story of how downturns begin, and not why they persist. Yes, it would be more “correct” to use the BEA’s measure of potential output. But the results would be qualitatively very similar, and I don’t think there’s nearly enough precision in measures of potential output to make the few tenths of a point difference meaningful. 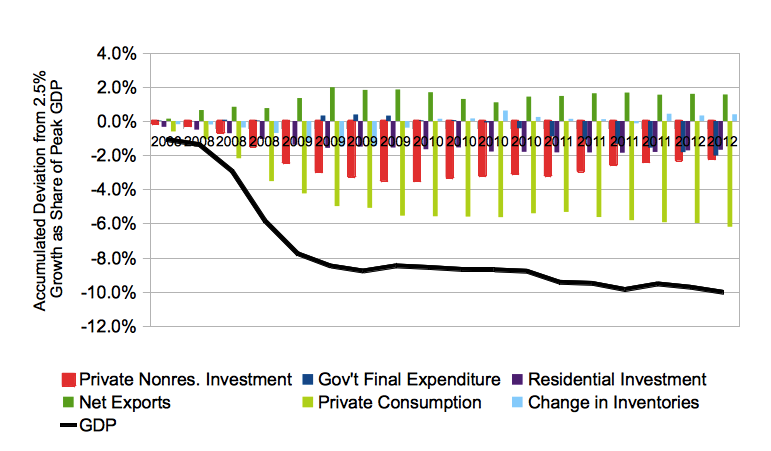 LATE UPDATE: Here is a similar graph for the previous recession & recovery. Does the information on closed accounts have a breakdown on whether the accounts were closed at the behest of the customer or the bank? Yes, that was the first question I asked too. Unfortunately, the answer seems to be No, at least as far as the published report goes. But I don't think this is really a problem as far as the argument of this post goes. First, we do know that the majority of the accounts closed were due to charge-offs — bankruptcies, essentially — which are certainly not the result of choices made by lenders. Second, it is hard to believe that there would have been a major tightening of standards in terms of closing existing accounts without any tightening as far as new accounts are concerned. 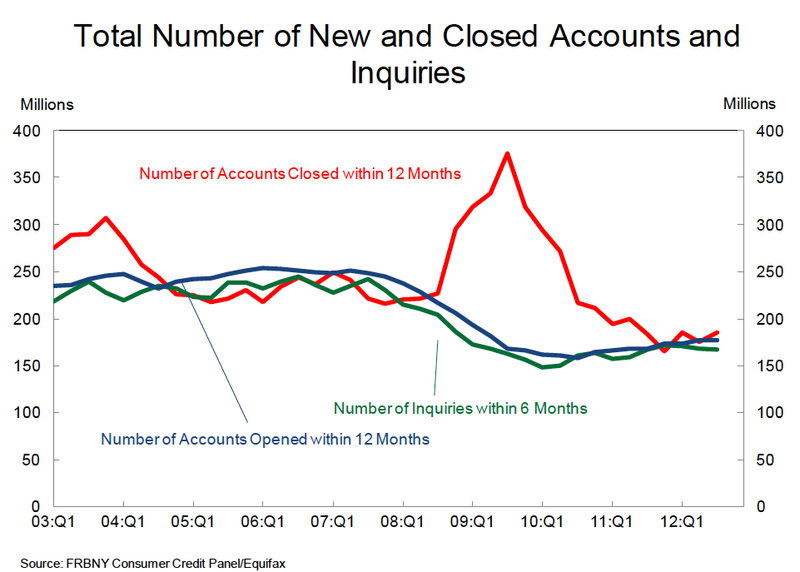 And third, even if for some reason banks were aggressively closing existing accounts without changing their standards for new ones, the elevated account closings came in 2009 and early 2010, so that wouldn't explain why credit card debt has stayed low. As I said, it's one thing to say that a lack of liquidity of precipitated the crisis, and something else again to say it's why activity remains depressed today. Seems like diverging income trends would round out the picture. Middle income households experienced a decline in real wages; they borrowed (from non-consuming top 5%) to finance current expenditure. During the GFC they realized the drop was really a downshift in trend. Now levered households are income-constrained and will not borrow to make up the difference (outside the stability corridor). Meanwhile, the top 5%, who hold about 70% of financial claims, are also experiencing a downshift in return expectations on those claims. This is an adverse feedback loop. The Fed thinks its job is to convince the top 5% that the level of historical real returns will come back, but the root of the problem is not asset prices but middle class real wages. This is why the "equilibrium" prescription of first threatening to reduce real wages is counterproductive: it only feeds the adverse loop. Another way to think about it is through path dependence. A household experiencing trend income might view a drop in that income as temporary, and need only access to credit to maintain "equilibrium" spending. But introduce a secular decline in real wages, and a recessionary drop in income becomes a "confirmation signal" of a change in trend, not of a temporary disequilibrium. How are "inquiries" generated and measured? Do they strongly response to advertising and promotions? Good question, I don't know exactly. (A comrade is considering taking a job at the NY Fed. I kind of hope he does, just so I have someone to ask things like this.) But my understanding is it basically corresponds to applications. So, yes, in principle, it's not strictly a measure of credit demand, but also reflects supply conditions to some extent as well. But while I accept your point in principle, I'm very skeptical that short-run variation in inquiries reflect changes in marketing intensity, as opposed to credit demand. That's probably beyond the point of the OP, but, what do you mean exactly by "equilibrium"? I ask this because some time ago, when you posted something about Steve Keen, I had this strange realization: that I believed that I understood very well what Keen meant when ha said that the market are always in disequilibrium, but then after reading your interpretation I didn't understand it anymore. After some soul searching, I came to the conclusion that economists use the word "equilibrium" a lot, but often to mean different things. In particular, when the term refers to some sort of general equilibrium, it becomes very ambiguous because nobody ever mentions what are the things that are supposed to be in equilibrium whith each other, but different schools of economics often think to different elements as endogenous, so that two economist can say "the market is in equilibrium" and "the market is in disequilibrium" and be both right, since they mean different things by "equilibrium" (but they would still quarrel a lot I suppose). 1) suppose that, in a market, some people produce shirts, other throusers. But people change shirts more often that throusers, so that there is more demand for shirts, that sell at a better price. Thus some throusermakers realize that they can make more money by making shirts and change jobs. The process goes on until people make more or less the same by producing shirts or throusers: but at this point the market is at equilibrium both in prices and in quantities, meaning that it reached the ideal mix of throusermakers and shirtmakers. This is a concept of equilibrium that is A) ideal, B) relative to the quantity of goods, C) leads to a labor theory of value. However, this says nothing about how many people are employed: the market could reach this equilibrium whith 5% unemployment or whith 90% unemployment. First, it is obvious that in a market society stuff is produced only as long that people will buy it, but this just means that every level of employment is a potential equilibrium: if less people are employed, there will be less demand, so that the lower production will be enough for the lower demand (Say's law in reverse). Then there is capital investiment, that is often referred to as linked to savings. But capital investiment is not at all a form of saving in the usual term: suppose I save some money, lending it to a bank. The bank lends the money to an enterpreneur that builds a house. But to build the house he has to pay workers and materials (which also are produced by workers). The workers then use their wages to buy consumption goods. In this example, it is obvious that there are no real savings: simply the workers consume goods instead of me consuming the same goods. In fact this is necessarious because, if there really were savings (that is, a lower aggregate consumption of goods) extra goods would simply go bad, plus a recession would ensue. However somehow savings are supposed to be necessarious to investiment, and also there is a supposed equilibrium between savings, capital investiment, and consumption (??). So I ask: could you please specify what do you mean by "equilibrium" when you speak of multiple equilibria, and more precisely what are the elements that are supposed to be in relative equilibrium and what are the mechanisms that enforce these equilibria? PS: please excuse me if my comments are off thread or somehow dismissive to the post, which in facts I found very interesting. I write this because I realize that I often sound more aggressive than I would like in my comments. I like Diego Espinoza's comment. And what about the lower end of the economic scale? Maybe a segment of the population has stopped using credit because they've maxed out their credit cards. Maybe they don't even have any, and rely on pawn shops, pay-day lenders, and loan sharks to get from pay check to pay check. Maybe Moose and Rocco have threatened to break their legs if they don't pay what they already owe. To what extent does the functioning of the economy depend on the spending of people who perforce spend every penny they make? I'm talking about the lower 20% or so who have zero or negative net worth. Reduced income for these people leads to a direct hit on GDP. Is it big enough to matter? This is a segment of the population that seems to get ignored in economic theory – which, I suppose, is why spending can be considered to depend on wealth rather than income, despite the evidence to the contrary. Great post as usual. I finally got time to read Leijonhufvud, many thoughts from that and this. Could high and low inflation be indicative of (but not [necessarily] causative of) situations in which the economy is straying from the virtuous stable center — and equity markets know that on some level, lowering the price they're willing to pay for, their expectations for, future real growth (as proxied by equity prices)? The authors explicitly mention instability worries as their explanation for the low equity prices during high inflation. So this graph could be interpreted as some evidence for the corridor hypothesis. Agree with Steve, great post again. Diego and Jazzbumpa also bring up some interesting questions related to my initial thoughts on the matter. The way you describe DeLong's claim makes perfect sense and this data does present reason to believe consumers are not credit-constrained in that specific sense. My current view of the recent crisis is that consumers' face a different type of credit constraint. Rather than banks being unwilling to meet credit demand, its the principal and interest payments on outstanding household debt that is discouraging credit demand and consumption. This could be partially due to declines in income and/or balance sheet losses related to falling housing prices. The Bubble and Beyond by Michael Hudson describes these issues in much more depth and I find it fairly convincing. If the above is at least partially true, it would not be surprising that mainstream models are ill-equipped to recognize that causal-chain. Your posts on this stuff have been great, and pretty much match my thinking exactly. 1. It's important not to focus exclusively on business lending. I don't know about the euro area (wish I did!) but in the US nonresidential fixed investment has recovered quite nicely since the recession. The reason demand and therefore activity are still low, is that consumption is still low relative to income, compared with the 2000s (or alternatively, because investment never fully recovered after the dotcom crash.) So if we want to tell a story about credit constraints holding back the recovery, we should probably focus on credit to households. That's why the credit card data is so interesting. 2. You mention the NFIB survey, which is a good source on this stuff. But you say "finance and interest rates are the last thing on their list of business constraints. Dead last. Always. ", which is not quite right. The survey actually goes back to 1974, not just to 1986 as you say, and in fact from 1980 to 1983 or so interest and finance were small businesses' number one concern. I think this is important, and actually strengthens the case that credit is not the problem now, by clarifying that if credit really was holding back aggregate activity that would show up in the data. There is a temptation in some heterodox circles to say that the interest-elasticity of activity is *always* low, which I think is a mistake. 3. You are absolutely right that the "won't be able to make payroll" line is moronic. As I've pointed out here before, short-term credit amounts to less than 5 percent of annual revenue for most nonfinancial businesses. So even being completely cut off from the credit markets would be equivalent to only a moderate loss of sales. 4. An important point that needs to be developed more is the way that increased — and increasingly profit-sensitive — payouts to shareholders change the relationship between credit and investment. In effect, since the mid-1980s shareholders have been residual claimants of corporate profits not just in principle but to a large extent in practice too. So, suppose that shareholders are indifferent between a dollar of payout today and an investment project yielding X%. Then if interest rates are below X, they will not affect the hurdle rate for investment, they will just result in firms incurring more debt and paying the proceeds out to shareholders, i.e. monetizing their creditworthiness. Only when interest rates rise above X will they affect the hurdle rate on new investment. It seems to me that this is very much what we see in practice. Previous Previous post: IMF: Abolish the Debt!